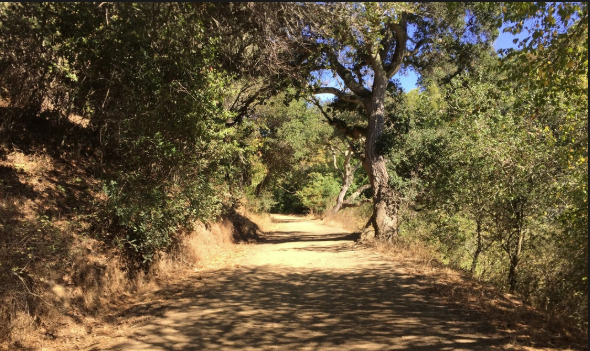 Description: Wide dirt trail (fire road) traversing the Berkeley hills through Oak, Bay, Eucalyptus, and Chaparral. After a short (~30 yds) stretch of ~20º incline the trail levels out and traverses the west-facing slopes below Grizzly Peak Blvd, high above the Cal campus. On a clear day the view of the campus, the city of Berkeley, the Bay, and the Golden Gate to the Pacific Ocean is spectacular. At 1.5 miles we can turn around and return to the trailhead. Those with more energy can walk an extra ½ mile or so, which tends more downhill on a gentle slope. Where to meet: Meet on the west side of Grizzly Peak Blvd, just a few yds south of the intersection with Centennial Drive. What to bring: Good hiking shoes or boots for the trails, layered clothing for variable weather, water, windbreaker, snacks. Hiking poles are optional, but a good idea, especially for the “steep” parts. Rain cancels. Directions: Drive East on University Ave in Berkeley to Oxford Ave. Turn Left, proceed to Hearst and turn Right. Proceed past Euclid Ave to the next stoplight, and turn Right onto Gayley Road. Pass the Greek Theater on the left and turn Left onto Rim Way, then turn Left onto Centennial Dr. Continue up Centennial Dr., passing Lawrence Hall of Science. At the top of the ridge, turn Right onto Grizzly Peak Boulevard. Park alongside the road. (audrenew@gmail.com) (510) 548-0530 a few days in advance for arranging a pickup near your home or at a BART station. PUBLIC TRANSIT: see AC TRANSIT by calling 511, or on the internet at 511.org.